In the era of cross-border e-commerce, buyers usually wait for the goods to arrive after placing an order on the e-commerce platform, while the seller has to arrange production and logistics for shipment. These are only for those small and medium-sized commodities. 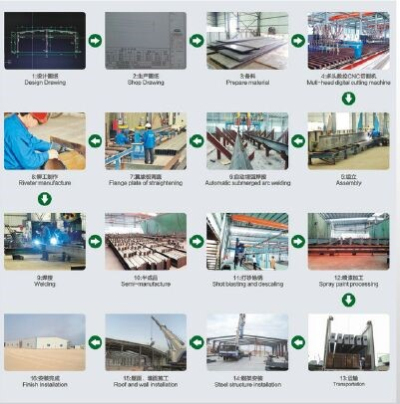 The steel structure manufacturer's product arrangement process is a lot more complex, when the customer placed an order, first to negotiate prices with the business department, installation procedures and other series of issues. At the same time, the installation should also consider the local climate, how to install more reasonable. After these negotiations, the order will be notified to the design department by the design department installation drawings, production drawings issued to the workshop supervisor to arrange production. 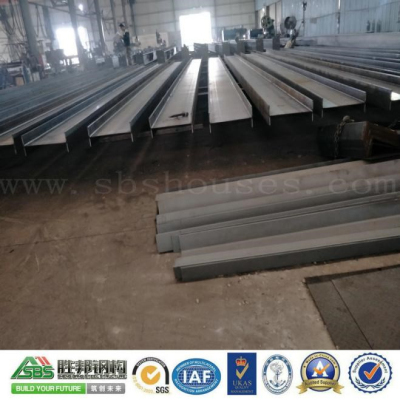 The steel structure manufacturer begins with stock preparation, The stock preparation is based on the customer's contract. It is the processing of the incoming material or the raw material, and then begins to cut, set up, and weld. Straightening, riveting, welding, semi-finished products, large sand rust removal, paint processing and other processes are completed. The seller or buyer arranges the car for transportation and installation. In addition to the installation of prefabricated steel structure compared with other buildings more light and convenient to install. In December 10th 2017, we received an order from a large and famous door industry. The customer requested delivery of the goods on January 10, 2018.01.10, and the first goods were delivered on 17th. The contents of each shipment are recorded in detail so as to facilitate the workshop to know about when and what materials come in the morning each afternoon to specify the number of production in each group. By December 24, 2017.2017.12.24, all expected to be a total of eight vehicles. The following is a semi-finished product diagram of the production process. Half of the date of the contract. 12.29 the design department also completed the warehouse receipt. The weather was not beautiful, New Year's Day came back on 2018. After a few days of rain delivery was also delayed, only in the time of 1. 6 the first cargo. Then it rained three days a week and the customer couldn't ship the steel until it was delivered. The rain also reminded us of the orderly production. Pay attention not only to the delivery date but also to the climate change before and after the delivery date, and then arrange the transportation installation.